As my first quarter comes to a close, I’ve been reflecting on all of the amazing experiences I’ve had at Northwestern so far. Now that I am more familiar with campus, I’ve compiled a list of the things that NU students, and Elks scholars across the country, will need in the coming quarters. Things I’m sure you will find on all Wildcats’ Christmas lists. 1. A camera to capture all of the memories you’ll want to remember forever. One of my favorite things about NU is that there is ALWAYS something to do. 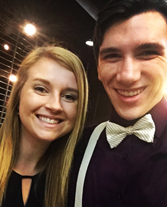 The best event this past quarter was the Residential College Formal. My friends and I got all dressed up and went to Navy Pier for a night of dancing and amazing food (truffle mac and cheese and jumbo crab cakes were on the menu so amazing might be an understatement). 2. Spirit wear to show off your purple pride. With a 10-2 football record, everyone is eager to support our fellow Wildcats. 3. Money will be helpful for any student that decides to make spontaneous trips into Chicago like me. How could you not when there’s a free intercampus shuttle? This past week I had a “Christmas in Chicago” day with one of my really good friends. We went to the Christkindlmarket, took a trip to see the huge Christmas tree, and even got to go ice skating at Millennium Park. 4. A planner to keep all of your responsibilities straight. Most people I know are involved with at least two to three extracurricular activities. My main priority is MUN or Model United Nations. MUN is an educational opportunity that allows high school students to learn more about diplomacy and many of the issues facing our world today. Participants, or delegates, are placed in committees, assigned countries, and then given a particular topic to research and debate. Every year, NU hosts its own conference, which is where I come in. I am a Vice Chair on the Security Council so it’s my job to help formulate topics and provide background for the delegates on what they will be debating. It has been so much fun so far and the perfect club for a political science major, like myself. 5. A coffee mug for obvious reasons. 6. Tupperware- In an annual published list by The Daily Meal, NU was ranked as the fifth best college for food. What sets us apart from the competition is our weekly Hot Cookie Bar. This cookie phenomenon occurs every Friday, with each dining hall making anywhere from two to 31 trays of half-baked cookie dough goodness. Needless to say that Tupperware for leftovers would come in extremely handy for any and every NU student. 7. Parka- The mild temperatures of the past two months are only the calm before the storm. Students are getting ready now because the cold is coming and we all know it. 8. Shorts- because anyone who lives in Illinois knows that it can be 20 degrees in the morning and 70 in the afternoon. 9. A paint brush- In the early 1940’s students began painting the giant rock in the center of campus. What first started as a prank has become an accepted avenue of expression. Now, almost every night the rock is repainted with symbols promoting different clubs or events on campus. 10. A sharpie and some paper- with all of the amazing people that come to NU every student should have both of these at the ready, at all times! They would be helpful for taking notes and hopefully getting an autograph. 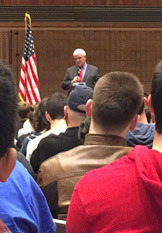 This past quarter, I’ve gone to a talk with both Newt Gingrich, the former Speaker of the House, and Ta Nehisi Coates, political activist and author of Between the World and Me.